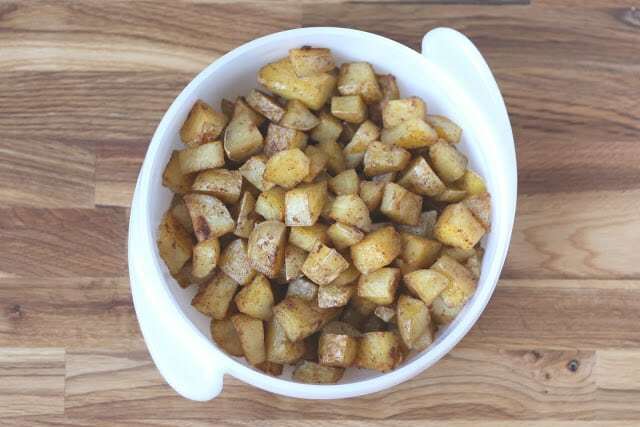 I love having roasted and pan fried potatoes with our eggs for breakfast. However, I am not about to spend an hour’s time to make them most mornings. What I do instead, is to throw a tray of these in the oven at other times during the day when I might already have the oven on. They take 45 minutes to cook; but when the oven is already on, it doesn’t seem like much effort at all. Preheat oven to 400 degrees. Scrub and rinse the potatoes. Cut them into slightly smaller than bite size pieces. Place them in a large bowl and drizzle a couple tablespoons of olive oil over them. Toss with your hands to thoroughly coat the pieces. Sprinkle generously with spices and toss again to coat well. Grease a baking sheet well with olive oil or use a silpat mat. Fill the tray with a single layer of the potato pieces and place in oven. Roast for 40-45 minutes, turning once after 20 minutes. Check them again around 40 minutes and stir or turn as needed. Let them get soft and then a bit crispy before removing them from the oven. Let them cool completely and then store in an airtight container in the refrigerator. When I am ready to use these, I simply put the amount that I need in a skillet over medium heat to warm them and let them get just a bit crispy before serving. Toss them with scrambled eggs, serve with Huevos Rancheros or any number of other breakfast dishes. I really need to start just throwing veggies in the oven more often so that I'll have them for later when I want them. These look perfectly crisp! I would definitely get out of bed for these - or maybe eat them in bed - with eggs! Now this is something I need to do! Definitely do this with leftover potatoes all the time. If you are doing them in tin foil on the grill (with steak, etc. ), make an extra packet for the next morning! I should have thought of this before...This is really cool. 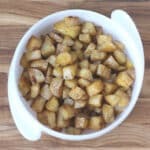 It is a very easy recipe made from our household favorite --- potatoes! This will be a breakfast, lunch and dinner staple! This is a great idea! I love potatoes reheated in a cast iron skillet for breakfast.